One of the biggest tests for any spacecraft comes when it's time to leave the edge of space and re-enter Earth's thick atmosphere. 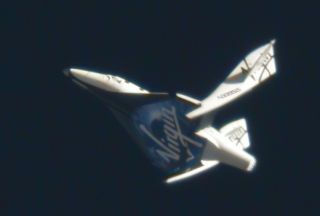 The suborbital spacecraft, built and designed by Scaled Composites of Mojave, Calif., sports an elegant feathered re-entry design that has drawn comparisons to a shuttlecock flying through the air in a badminton game. SpaceShipTwo's entire tail structure turns upward about 65 degrees, creating high drag that allows the laws of physics to control speed and altitude. "The big innovation that Scaled and Burt Rutan came up with was this idea to feather the aircraft into the atmosphere, so that the pilot could literally take his hands off the controls and it would stably enter because of the aerodynamic forces on the vehicle," said George Whitesides, CEO and President of Virgin Galactic, in the video. That video of the space tourist ship's re-entry test on May 4 shows a stable, controlled descent during the first-ever deployment of the feathered configuration. After completing re-entry, SpaceShipTwo's tail structure can lower again at around 70,000 feet, allowing the vehicle to glide back down to the spaceport runway. Once it was released from its mothership WhiteKnightTwo, SpaceShipTwo's recent test flight lasted 11 minutes and 5 seconds. It marked the seventh glide test for the spaceship, officially known as the VSS Enterprise, and a steady ramp-up toward future space tourism flights backed by British billionaire Sir Richard Branson, founder of Virgin Galactic. "Today we received confirmation that the basic design of the spaceship is solid," Whitesides said in the video.